Time Warner was here on Friday, and they determined that our internet connection issues were due to the Netgear that needed to be replaced. So as promised, I was finally able to get our Martha's Vineyard photos posted on the blog. The weekend was nice...Friday evening we went to our camp and took oldest son's sweet puppy with us. The little guy went for his first swim in the lake, and his first sunset. The lighthouse in the photo above is the Gay Head Lighthouse. The name comes from the "gaily" colored clay in the cliffs. Even the stones in the ocean are orange.The area is remote and at the westernmost tip of the island. The view from the lighthouse shows the eroding cliffs, and the lighthouse folks told us that the lighthouse will be moved within two years. The lighthouse is open for tours. The area around the lighthouse is owned by the Wamponoag Tribe. The lighthouse was built in 1856 and sits on the cliffs above the ocean. If you get the chance to visit this awe-inspiring, beautifully situated lighthouse, BY ALL MEANS DO!! This is our favorite beach on Martha's Vineyard. Gay Head Beach. From the Gay Head Lighthouse, there are views of the Atlantic to the south, Rhode Island and Block Island to the west, and all of Vineyard sound to the north and east. Summer scene in Vineyard Haven. 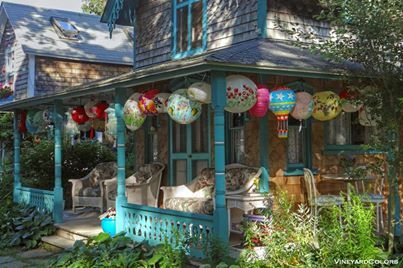 This is Susan Branch's house in Vineyard Haven for you fans ;-) I went to a bookstore just up the street from where she lives, and asked if they had any Susan Branch 2014 calendars since I was shopping for a friend. They asked me to spell the name :-) The sweet girl was young and probably didn't know her. This was one of our many beach days. It didn't rain a drop while we were on vacation. I picked this vacation in Feburary, so I know we got very lucky. Joe and I with the Gay Head Light in the background. We were there to watch the sunset, and people were very willing to take photos of us. I could spend hours looking at yachts. I am intrigued by the names. There are five lighthouse on the island. This is West Chop lighthouse. This is the Edgartown Lighthouse taken from quiet Fuller Street. Fresh caught oysters for Joe in Menemsha. The sun goes down at Gay Head Cliffs. The Black Dog schooner has been anchored for four decades. So cool! I would love to be there some year in August for Grand Illumination Night. I hope you enjoyed your visit. Thanks for stopping by! Gay Head..I remember visiting..and then yrs later JFK junior's untimely death..:( His wife's and sister's if I recall correctly..leaving so many to mourn.. Loved Oak Bluffs..I could live there..I was told that they are handed down family to family and rarely ever come on the market..this was years ago..15 I think..
Bad hair days:) Especially if prone to frizzies..(moi) .. The humidity was in force when we went..
You were very lucky with the weather! I think I'd love to go there. The gingerbread cottage is so pretty! Glad you had a great time! p.s. How'd you get the photo of the sunset to shimmer?? Loved that!! Kitty, the photo of the sunset was shimmering since it was a video. I'm glad you enjoyed it! It was fun to see your pics...Did you take the ferry to Chappy? And you did not go into Susan's backyard??? As for moving the lighthouse - they have moved the 3 Sisters on Cape Cod a few times due to erosion - so sad to see the beaches and dunes slowly erode! Glad you enjoyed your getaway! Patti, we didn't take the ferry to Chappy this trip. We have done it before, and will include it next time we go. Oh, what a great vacation! It's been too many years since we were on the Vineyard. 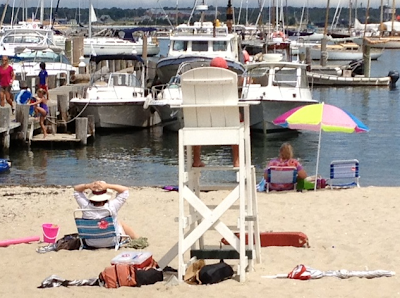 Love the Cape, Nantucket, and Martha's V. Thanks for sharing all the lovely photos! These are beautiful photos of a wonderful vacation. I love the Susan Branch story. I have a couple of her books. I wish I knew where to get her calendars. Wonderful post! It is a beautiful spot. We used to spend some time there when we spent 2 weeks on the Cape every summer. But once we bought in Southampton, we never went again. Very much like here. Glad you had a good time.